Stephane Grappelli (originally surname was spelled with a 'Y') would have earned himself a place in Jazz History books if only for his important role in the Quintette of the Hot Club of France, featuring the dazzling virtuosity of Django Reindhart. Grappelli's violin was the perfect foil to Reindhart's guitar in this piano-less group. Fired by Reindhart's tremendous rhythmic powers, Grappelli's contributions to recordings by the Quintette like Lime House Blues, China Boy and It Don't Mean A Thing (all 1935) and Them There Eyes, Three little Words and Swing '39 (these latter three tracks from 1938-39) were admirable in their execution. Occasionally Grappelli would play piano, as when harmonica virtuoso Larry Adler recorded with the group in 1939, the year when Reindhart and Grappelli, violin, recorded (with delightful results) as a duo (all Django Reindhart). Grappelli born (1908) and raised in Paris was involved with music at a very early age. By 12 years, he had acquired his first violin- just one of several instruments he learned to play. He began professionally with theatre bands, eventually being introduced to jazz music. A French jazz musician, Philippe Brun, introduced Grappelli to Reindhart. Soon after that meeting they put the idea of Quintette into practice. When World War II commenced, Grappelli and the band were touring Britain. While the others returned to Paris Grappelli decided to stay. During the next six years he became a popular figure in London with habitues of nightlife in general and in musical entertainment in particular, working with local musicians in the local clubs. In 1946, he returned to Paris, renewed association with Reindhart, but he magic of pre-war days did not re-appear too often. Between 1948-55 worked in Club Saint Germain, Paris, and in the latter year played nine-month residency in St. Tropez. During the '70s Grappelli has played throughout Europe, in Clubs, concerts and festivals, has and broadcast televised extensively, and has been a regular visitor to the recording studio. 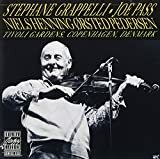 In 1966, Grappelli was recorded in concert in Switzerland, together with fellow jazz violinist Jean-Luc Ponty, Stuff Smith and Svend Asmussen (Violin Summit). Since then he has recorded frequently in London. A live date at the Queen Elizabeth Hall (Stephane Grappelli 1972) finds him responding to an enthusiastic audience. Elsewhere he has recorded with much success, with Americans Gary Burton (Paris Encounter), Bill Coleman (Stephane Grappelli-Bill Coleman), Roland Hanna, (Stephane Grappelli Meets he Rhythm Section) and Barney Kessel (I Remember Django). All About Jazz musician pages are maintained by musicians, publicists and trusted members like you. Interested? Tell us why you would like to improve the Stephane Grappelli musician page.